Derrick Kosinski & Scott Yager break down The Final Reckoning Finale! No guest today! For those of you asking for our initial thoughts on last week's BONKERS finale, here they are! The season that started in early July has finally come to a close, and a controversial close at that. Even though Scott (@SHOTOFYAGER) is in New Zealand, he couldn't resist hooking up with Derrick (@DerrickMTV) to begin to dive into what will likely be a multi-week conversation about the season and the ... See More final that was. 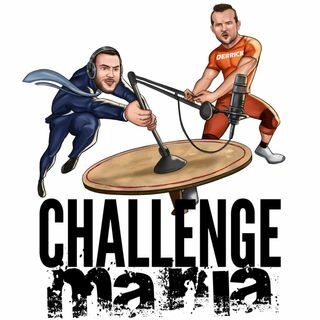 This is the kind of episode that is typically one of our BONUS PODCASTS over at www.Patreon.com/ChallengeMania. Because the final is such a hot button issue right now and we want to keep the content coming your way, and even with Scott in transit back to the states from New Zealand, we have decided to make this an iTunes podcast for you as well! Our patrons enjoyed it a few days early, but now it's here for your listening pleasure too. In this episode we discuss the grenades and how they were used, how the final stacks up against recent competitions, whether Ashley made the right move, what Hunter could have done to change his fate and MUCH MORE! If you sign up to become a patron today, not only will you get all of our bonus content like this, you might also be a part of our special One Year Anniversary Episode of Challenge Mania where YOU GUYS will be calling in to serve as guests for the show! Brooklinen is giving Maniacs $20 OFF and Free Shipping at www.Brooklinen.com/Mania with the code MANIA! Poshmark are giving Maniacs $5 off their first order. Download the Poshmark app today and use the code CHALLENGEMANIA. Check out www.OnYourOwn.ORG/MANIA, a great free resource for financial decisions! They're a great new sponsor of ours that will educate you and help empower you to make better financial decisions!